Google forecasts that by 2015 half of online ads will be video based, rich media will account for half of brand campaigns, and half of targeted ads will be bought through a bidding process. The money being spent right now is already huge, so it is critical that we understand how to optimize rich media campaigns as budgets for them continue to grow. 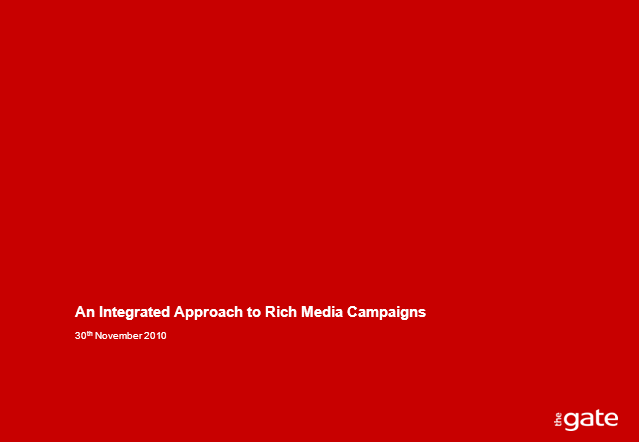 Join members of The Gate Worldwide's digital team as they provide insight into how to effectively deliver an integrated approach to your rich media advertising.